We must save "Grandma Lydia's Curtains." 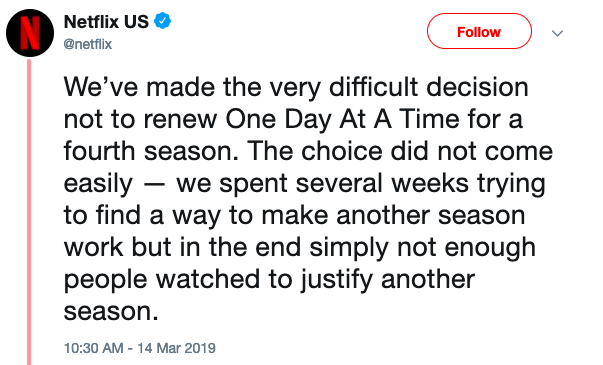 This past week, Netflix made the decision to cancel one of their Netflix Originals "One Day At A Time" after three seasons. The show surrounded the lives of a close to average Cuban family going through the difficulties of living the American lifestyle and touching on important controversial topics that include speaking on LGBTQ+, alcoholism, PTSD, and immigration. The news of "One Day At A Time" being on the verge to cancelation was released a week before the confirmation was made by Netflix. Fans of the show quickly took to all social media platforms and started #RenewODAAT, pleading the streaming company to renew the show as well as encourage those reviewing the hashtag to give the show a shot and see it's worth and why many are fighting to keep it running. The central issue to viewers that are upset over this decision correlates to an ongoing, years-long discussions and debates over Netflix renewing and heavily promoting their original shows that are controversially talked about in the media more so due to viewers believing it shouldn't be shown on any form of television and it can create a sense of uncomfortableness for example, 13 Reasons Why. Latino's stress over the fact that there isn't much representation of themselves or their lifestyles on television which is true. The importance of having a foundation of a television show like "One Day At A Time" that is explaining issues that every kind of person goes through no matter your sexuality, race, or ethnicity. At the end of the day, no matter the background, we all go through at least one type of issue that they speak about on the show and I believe that's the most important thing to take away as a fan of this show. 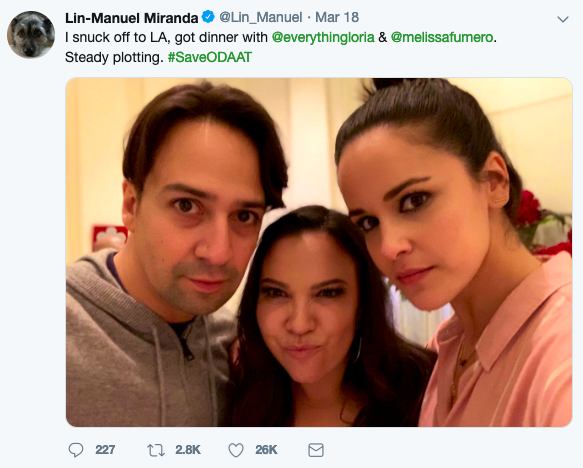 With the help of Lin-Manuel Miranda, creator of hit Broadway show "Hamilton," Melissa Fumero, star of "Brooklyn Nine-Nine," and Gloria Caleron Kellett, one of the creators for the Netflix original, a new home may be coming soon to the loved series. It's incredible to see a different type of family, whom many can relate their own family to, go through some troubling topics that viewers don't see being spoken about on big time television networks; which is why #SaveODAAT continues to trend on social media with the hopes that the show will be picked up by another network. Environmental documentaries have profound effects on the ways in which we see the world, and when it comes to issues such as advocating for climate change, the result can be good. Climate change is a serious problem, and continues to become an increasingly dangerous threat to future generations for all species of life on Earth. The mass media has a profound influence on our own opinions, beliefs, and views about the world around us. Documentary films and television communicate and educate us about the natural world to the public. It let's us easily access places in our world we have never seen or heard of before. From the deep ocean depths to the tips of glaciers in the Arctic to the great sand dunes of Africa, because of the documentaries, we are able to experience these distant unworldly places through our very own eyes. Environmental documentaries not only educate and inform audiences, but they are also capable of deeply impacting audiences. These films connect causes and consequences of environmental issues in a narrative that initiates an emotional engagement with the material we are viewing. These issues are also met with contrasting political viewpoints. In addition to educational purposes, these films also advocate for personal or collective action, or policy change. Filmmakers are using documentary films and television programs to both inform audiences on the facts of environmental issues, as well as persuading those that this problem is in fact real, and desperately needs urgent human action. For example, climate change is a direct threat to our planet and all species of life. It is also a highly political issue. Documentaries advocate a clear and political viewpoint that addresses the issues of climate change, as well as a message urging for individuals or collective behaviors to mitigate climate change. The facts and images of the issues shown are usually fear-inducing messages that includes information about how to reduce the threat at hand. Environmental documentaries like Blackfish and Our Planet, both make us question our relationships to nature, animals and the world around us. The issue of animal rights and the detrimental impacts of our ecological footprint as a global society is evoked by empathy, in both films. Climate change documentaries focus on the consequences for humans and the natural world. Environmental issue documentaries are so effective in the way in which they impact public opinions about these issues, as well as produce effective messages that initiate an emotional response, and call to action.